Morocco has the distinction of being the only country to which I've arrived by sea. It was just a short jaunt out of Algeciras, Spain to Tangier, the ancient Phoenician trading port turned crowded a,nd polluted mess that it is today. 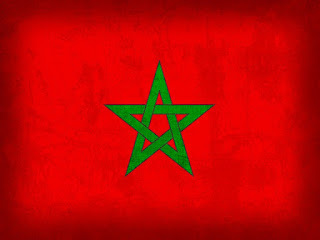 I did not see the side of Morocco featured in Casablanca, a place of romance and luxury frequented by celebrities and rich Europeans, or the sweeping dunes of the northern Sahara, or even the peaks of the Atlas Mountains looming to the south. No, my experience here on a fogged in spring day in May was one of impoverished children begging for money, bazaars filled with noisy merchants and peddlers, leather factories of a scent so offensive you had to hold mint to your face. Our group was whisked from place to place, spending just enough time in each to allow us North Americans to check the box on each our limited North African stereotypes: Moroccan rug factory? Sure! Want to ride a camel? When in Rome! Belly dancing? Cous cous? Fez hats? Yep. Yep. Yep. I certainly don't regret my experience here, and unlike my time in the DR where being a tourist meant separation from culture, one cannot escape being fully immersed in Moroccan culture from their first step into Tangier. Case in point: the Adhan. At first it's subtle... A farwaway droning that you think may just be a figment of your imagination. But then as more and more speakers join in it's unmistakable: the Islamic call to prayer. Raising up from the bowels of the city in a slow and almost ominous crescendo, being a westerner while this ancient and sacred ritual happened made me feel as if I were in another world. The city stopped. The noisy merchants, the businessmen, the kids even.... Faced east towards Mecca while "Allahu Akbar" was slowly chanted over and over again from the rooftops of the city. That's when I knew I was truly experiencing different culture: in contrast to America, where we argue about whether it's appropriate or offensive to pray to yourself in a public space... Moroccans publically broadcast "God is good" on loudspeakers loud enough to be heard for miles. Even though I was only a few miles from Europe, Morocco made me feel as if I was completely detached from "the west". And for a moment, maybe I really was... Oh how I now truly felt like a world traveler. Gripping my souvenir Fez hat and hand crafted tom tom drum, I boarded the bus and headed back down to the harbor to brave the straights of Gibraltar and join back up with the West. The sail back to Algeciras turned out to be slightly more harrowing than most of us had bargained for. The wind had picked up that evening, and as it happens a sluggish ferry designed to shuttle cars a distance of 15 miles each way seems barely seaworthy when confronted with 20 foot swells. Combined with a poor ventilation system and the chain reaction effect, there were not many who did not part with their cous cous dinner on the sail home. For my part, climbing to the top deck of the boat and keeping my eye fixed on the horizon saved me from nausea. As the lights on the rock of Gibraltar began to appear in the distance, relief began to set in. The next few days back in Spain felt like returning home after having been in Morocco. For just a day, I knew that I had been as far from home as I'd ever been... And the feeling gave me a desire to experience more: the need to get lost, feel out of place, but be on an adventure. Unfortunately, my wife took a similar trip into Morocco a while back and was considerably less enamored by its leather factories, public baths and not quite pristine streets than I apparently was. So I am not sure when we'll be back together to this charming and exotic land... until next time Morocco: Here's looking at you, kid. #2 of 20 something. Spain.